Diabetes can cause significant eye-related complications if not properly managed and controlled. Diabetic retinopathy is the most common of these complications and is a leading cause of blindness in American adults. Patients may complain of specks, spots or floaters. Central vision may become blurred or go in and out of focus. Patients may complain of streaks or blockage of vision if a large hemorrhage occurs inside the eye. Others may notice difficulty seeing at night. The main culprit in the development of diabetic retinopathy is uncontrolled diabetes or high blood sugar. The severity of diabetic retinopathy is directly related to blood sugar control. The retina, the light-sensitive layer in the back of the eye, has a rich supply of blood vessels. When blood sugar levels become too high, these blood vessels become weak. The blood and fluid inside the blood vessels leak out into the retina. New blood vessels grow, but they are fragile and may leak fluid. This causes the retina to swell and become deprived of nutrients and oxygen, causing vision loss and possibly blindness. Ethnicity: Being of Hispanic or African-American heritage also places a person in a high-risk category for developing the disease. Diabetic retinopathy progresses through four major stages: mild nonproliferative, moderate nonproliferative, severe nonproliferative and proliferative diabetic retinopathy. 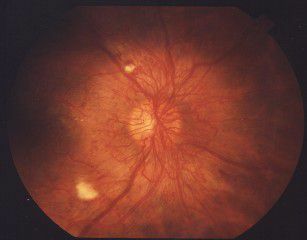 Proliferative: abnormal blood vessels begin to grow, but are weak and start to leak, possibly resulting in glaucoma, retinal detachments, and blindness. Seeing your optometrist or ophthalmologist for a complete eye examination on an annual basis or more often will aid in diagnosing diabetic retinopathy. During the examination, the doctor will administer special eye drops to dilate the pupils. This enlarges the pupils so the entire retina, along with the optic nerve, macula, and blood vessels, can be visualized. The doctor uses special magnifying lenses and microscopes to closely inspect the optic nerve and the macula for diabetic eye disease. Special dye-injection tests, called fluorescein angiograms, may be used to more accurately diagnose specific problem areas. In moderate stages of diabetic retinopathy, a focal laser procedure may be used to decrease the swelling within blood vessels. In more severe stages, "scattered laser treatments" may be used to reduce leaky blood vessels and inhibit the factors that cause the diabetic disease to take place. Scattered laser treatment may cause a loss of peripheral and night vision, but it may prevent more severe blindness from developing. A "vitrectomy" may be performed if significant bleeding occurs in the cavity of the eye. The vitreal fluid is removed, along with the blood, and is replaced with a clear fluid. The abnormal growth of new blood vessels may produce other complications. Neovascular glaucoma: Abnormal new blood vessels may grow on the iris. This can interfere with the normal flow of fluid out of your eye and cause pressure in your eye to increase, resulting in glaucoma.